The base is designed to create movement, making for some fun between sips. Looking for a new spin on enjoying your favorite beverage? These vinyl record-inspired glasses totally rock. No, really: The base is designed to create movement, making for some fun between sips. Also, they're printed in classic "record" colors, so drink mix-ups are a thing of the past—just like leisure suits. Glassware made in the USA, decorated in Edina, Minnesota. It was a gift for a friend who lives out of state, so I probably won't get to use the glasses, but he was really happy with them. Smiled from ear to ear! I may have to buy a set for myself. My daughter entertains a lot and I thought the glasses were a great conversation piece. Loved the look of these glasses. 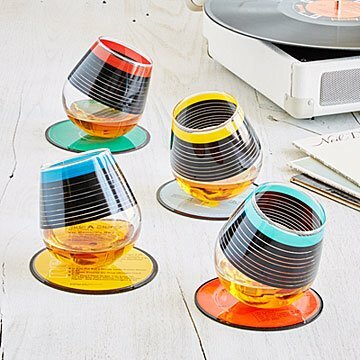 They are the perfect gift for our music-lover cousin. I hope they use them often while entertaining guests.